I know what you may be thinking...and no, the fact is I haven't abandoned my blog. I'm so sorry that it seems that way. I'm actually a Marketing Rep for Servpro of Lexington...a company that does all sorts of restoration & mitigation in buildings...and, if you haven't heard, Louisville, Kentucky got hit extremely hard with flooding this past Tuesday. So, I've been on site at U of L (basically since Tuesday) helping our amazing crew coordinate the campus cleanup. And, I will be heading back to Louisville bright and early tomorrow morning to return Thursday night at the earliest. So, the blogging hiatus will have to resume. 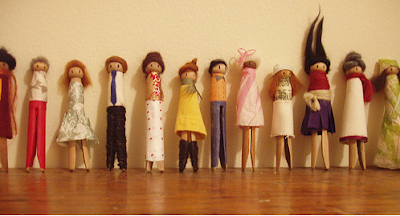 So, for now you will just have to enjoy these wonderfully clever clothes-pin dolls that I discovered through my ever-reliable flickr. See them here.